The immigration detention facility for undocumented immigrant minors in Tornillo will remain open another month, officials confirmed Friday. The facility was erected in June and was originally scheduled to close in July, but federal officials extended the contract with its service provider until Aug. 13. A spokesperson for the U.S. Department of Health and Human Services' Administration for Children and Families said the facility will now be up and running until Sept. 13. The detention center houses unaccompanied minors who crossed the border illegally. 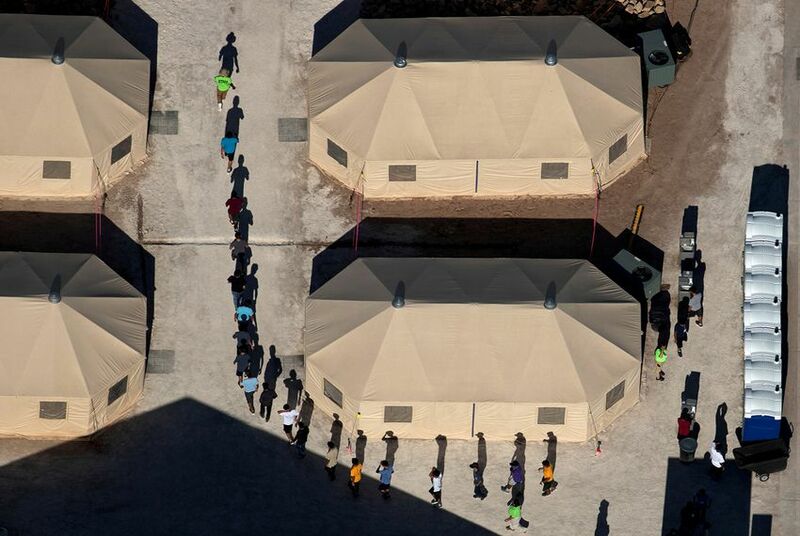 "HHS will continue to assess the need for this temporary shelter at Tornillo Land Port of Entry, Tornillo, Texas, based on projected need for beds and current capacity of the program," the spokesperson said in a news release. "HHS’ Office of Refugee Resettlement is continuously monitoring bed capacity available to provide shelter for minors who arrive at the U.S. border unaccompanied and are referred to HHS for care by immigration officials, as well as the information received from interagency partners, to inform any future decisions or actions." San Antonio-based BCFS Health and Human Services currently operates the facility, and the HHS spokesperson said in an email that no new contracts for operations at Tornillo were awarded. A spokesperson for the company confirmed on Tuesday that it will continue operating the facility. The announcement came the same day Democratic state Reps. César Blanco of El Paso, Mary González of Clint, Eddie Rodriguez of Austin, Ina Minjarez of San Antonio, Diego Bernalof San Antonio and Gina Hinojosa of Austin, all members of the Mexican American Legislative Caucus, toured the facility. They said there are more than 170 immigrant minors in Tornillo, but none are children who were separated from their parents or guardians under President Donald Trump's "zero tolerance" immigration policy. The facility previously housed a small number of those children, but they have all been released, Minjarez said. The lawmakers said that while attention from the border crisis has somewhat shifted to other topics, they wanted to keep a spotlight on the Trump administration's immigration policies and its effect on minor children. The Tornillo facility was constructed after the administration's "zero tolerance" policy was enacted and was only necessary because it led to an influx of children in other shelters who would otherwise have been left with their parents or guardians. "We are the only country in the world who incarcerates children [because] of their immigration status," González said. "At this moment in history, there are kids who could be with families. What we heard today was that the only thing that was stopping these kids from being with their sponsors or with their families [in the United States] was the federal government's lack of movement regarding background checks. All the kids had a place to go." González and Rodriguez said that because the Tornillo facility is on federal land, there is little lawmakers can do in terms of oversight and regulation. They said that policy could create an incentive for the federal government to construct similar detention centers elsewhere and shut out local or state lawmakers who oppose the administration's continued crackdown on undocumented immigrants who are seeking asylum in this country. "I think as members of the Texas Legislature, we want to try to get more oversight of these types of facilities, but when they are on federal land it becomes very challenging" Rodriguez said. "So what I am going to be looking at ... is what Congress does in terms of putting more of these on federal land so they take away [oversight] from the state government. If that happens, we'll have tent cities everywhere."